Antanas is a young Lithuanian conscripted to fight in the Soviet War in Afghanistan where he falls in love with a young Afghani nurse. She opens his eyes to the politics of the war, while making bearable the brutal reality of their situation – until her sudden death sends him spiralling into a breakdown and to a psychiatric hospital back home in Vilnius. 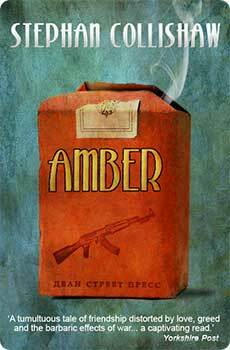 Vassily, a war comrade, rescues him and teaches him his trade – crafting amber jewellery – helping Antanas to let go of the past. But Vassily has a guilty secret – eight years later, on his deathbed, he cannot make a full confession, but charges Antanas with retrieving the priceless amber bracelet he smuggled out of Afghanistan during the war. After Antanas reluctantly agrees, he discovers not only that a dangerous rival is also searching for it, but also the terrible price Vassily paid for it. Only then can he truly make peace with the past and with his estranged wife.